Two people with fevers who entered Japan after traveling from Ebola-hit West African countries have tested negative for the deadly virus, the health ministry said Saturday. The two are a Japanese man in his 60s who returned to Tokyo from Liberia via Haneda airport on Tuesday, and a Guinean woman in her 20s who arrived at Kansai International Airport in Osaka Prefecture on Friday. The man was taken to the National Center for Global Health and Medicine in Shinjuku Ward. The woman was taken to Rinku General Medical Center in Izumisano, a city with a population of roughly 101,000 near the airport in Osaka. According to preliminary exams, the man was diagnosed as suffering from a type of throat inflammation, adenoiditis, caused by a bacterial infection, and the woman tested positive for malaria, the Health, Labor and Welfare Ministry said. 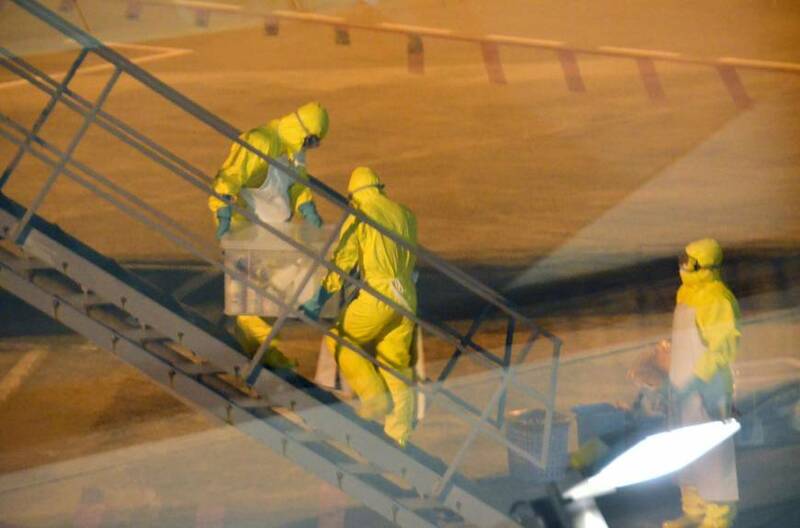 These are the second and third cases in Japan of suspected Ebola infection. Last month, a Canadian in his 40s complained of ill health upon arriving in Tokyo from Liberia, but blood tests proved negative. 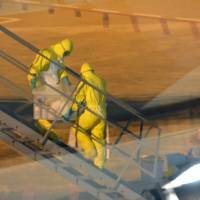 In the latest cases, the two claimed to have had no contact with Ebola patients in West Africa. The Guinean woman arrived at Kansai International Airport at 4:49 p.m. on Friday aboard Emirates Flight 316 from Dubai, the ministry said. A total of 238 passengers and crew members were aboard that flight. The man did not show any symptoms of fever or other illness when he returned to Tokyo on Tuesday but was confirmed to have a fever of 38.9 degrees Celsius at a clinic he visited Friday. The man stayed in Liberia for about a month until Oct. 26 on business, the ministry said. When he arrived home on Tuesday, he did not have symptoms associated with Ebola such as fever, and afterward reported to a quarantine office twice daily. He developed a fever on Thursday night and on Friday morning saw a doctor at a clinic in Machida, western Tokyo, who diagnosed him with tonsil inflammation. He later reported to the quarantine office, according to the ministry. The Canadian who complained of ill health upon arriving at Haneda airport on Oct. 27 tested negative twice and was released from the hospital after a few days. While trying to fend off Ebola’s entry into Japan, the government is extending aid to the international community to help finance the fight against the lethal virus. A new contribution of $100 million in humanitarian assistance was announced Friday, on top of $40 million that Prime Minister Shinzo Abe pledged at the U.N. General Assembly in New York in September at a high-level meeting held to combat the virus. “We think it is especially useful in the sense that it is a contribution towards rebuilding of health systems and it will have a long-term impact that will go on even after we have managed to beat the outbreak,” the spokesman, Stephane Dujarric, said in an interview. The U.S. State Department also welcomed Japan’s announcement of the additional funding to combat the spread of the virus. On top of the previous pledge, it “demonstrates important leadership in the global response to this crisis and is another example of Japan’s long-standing support for humanitarian assistance and long-term development projects in Africa,” spokeswoman Jen Psaki told reporters.